Aggie—farewell dear friend, RIP | Where to next? 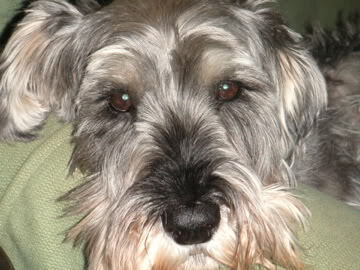 My dear Aggie—Agador Spartacus—is gone and I’m broken hearted. At the impressive age of at least 15, he had to be put down this morning. This was one of my biggest fears when we left Australia in May—that I might never see the old goat again. But I did see him this morning, on Skype, and it was confirmation that it was his time. When he left to go chase rabbits over the Rainbow Bridge, he was surrounded by love and farewelled with tears. 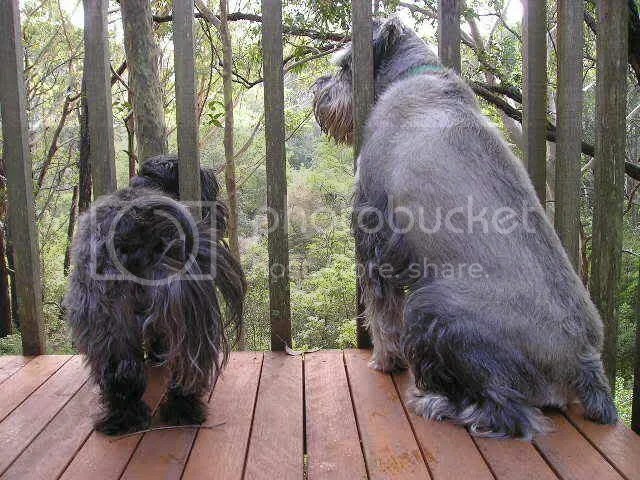 Aggie—who graces the banner of this blog—was a taller than normal standard schnauzer, and had more attitude than any dog I’ve ever known. We rescued him in 2002, when he was about six years old. He made his mark on the family immediately. Just this morning, Petra and I recalled that in the first week we had him, he casually jumped over the 6-foot fence in the backyard—from a sitting position. But we already knew this fellow was going to be a personality and hard to contain. I could write pages and pages about him, but I’ll share just a few snippets, and you can read about his not-German heritage. Chiyo and Aggie waiting for something to bark at. Thank you Graeme for loving and looking after Aggie so well in my absence. And thanks to Libby and Petra for being there for him with oodles of your own hugs and cuddles. And to dear Aggie, farewell my beloved friend. Enjoy chasing the rabbits and may you catch a cat or two. ← Groucho Marx of the dog world—update! Oh Peggy, so sad for you. I really liked Aggie too which is a big statement for me. I know you’ll be sad for quite a while but you can be comforted by knowing that he isn’t suffering. Take care and be happy for those nine years. He’d be especially pleased to be thought of as a legend! Thanks everyone for remembering him. He was a legend! And yes, Louise, I know what a big statement it is for you to like any dog. I’m so sorry to hear about aggie! I remember him with smiles and joy in my heart! lots of strenght! Thanks Sy. I’ve always loved the Rainbow Bridge poem. I’m sure Aggie is already terrorising the cats there. What a personality! Sorry to hear he was gone! I love dogs! Aggie was a great dog. Bad news Aggie—you aren’t German « Where to next? News flash for Aggie « Where to next? 10 dogs, 8 people, 5k—mission accomplished « Where to next? Another heartbreaking loss | Where to next?